Chocolate Espresso Spritz Cookies update traditional spritz cookies with barista-style flavor. 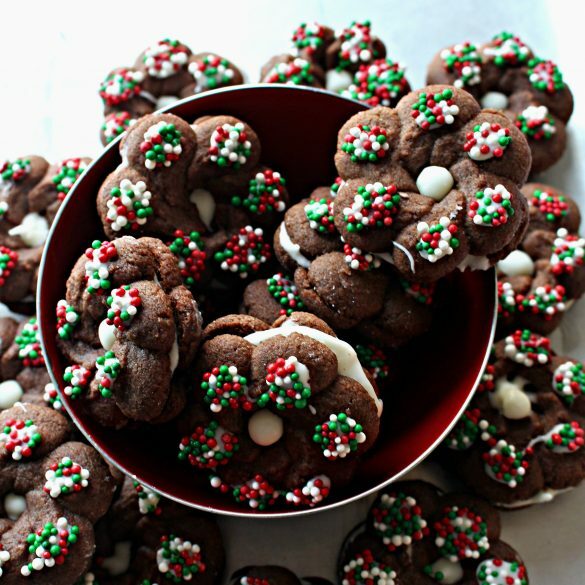 Sandwiched with melted chocolate, these festive butter cookies are a mouthful of deliciousness. It’s fun and easy to quickly make dozens of beautifully shaped cookies with a cookie press. 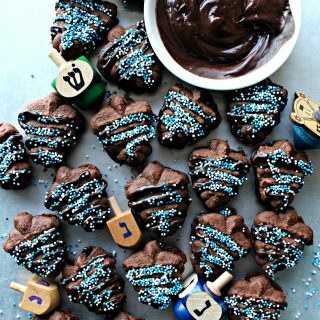 I’ve made spritz cookies in a variety of flavors and shapes including vanilla flowers, cinnamon owls, and now Chocolate Espresso Spritz Cookies Chanukah dreidels and Christmas wreaths. 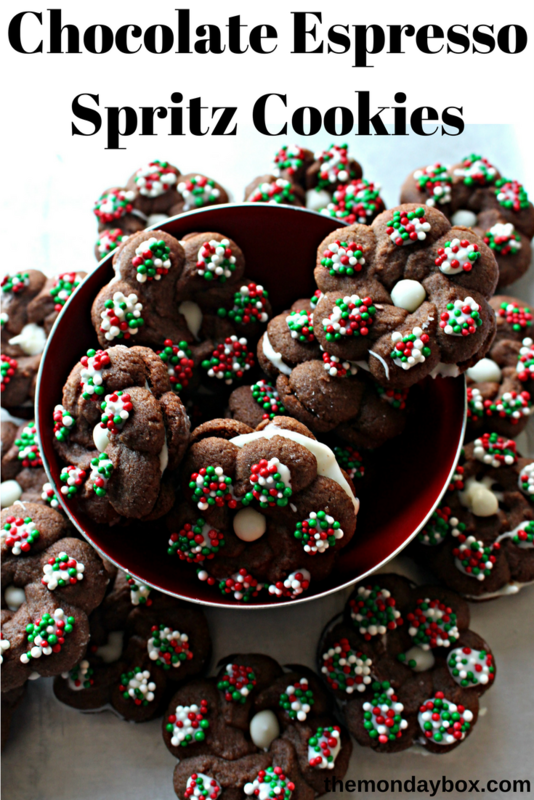 Spritz cookie recipes are simple to throw together. The only hard part is deciding which cookie shape to make first! There are so many cookie shape possibilities! 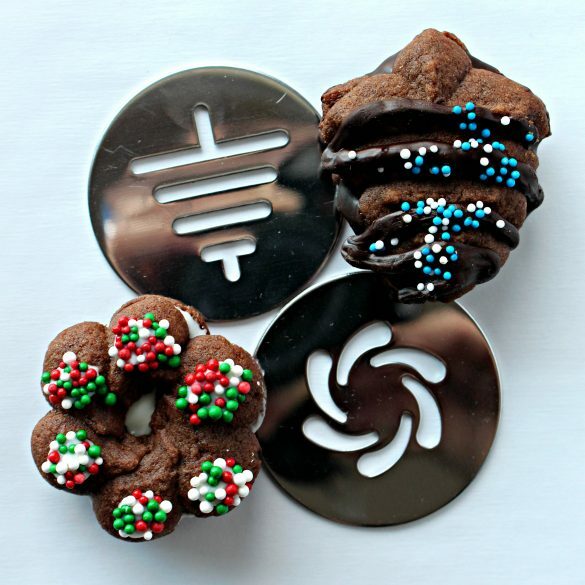 I use an OXO cookie press that comes with discs to create 10 different shapes, both seasonal and generic. 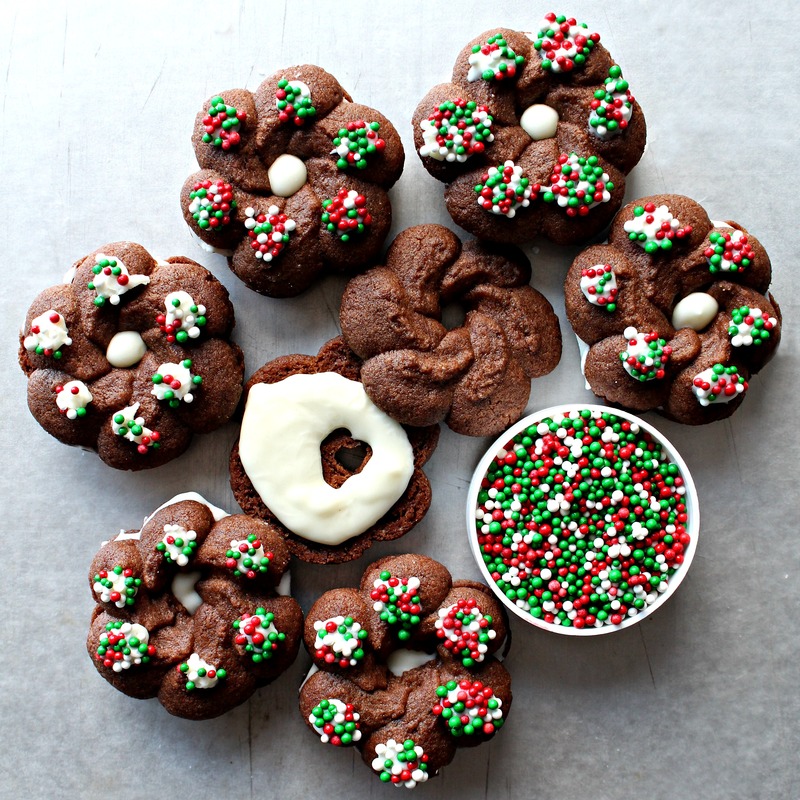 Some people think of spritz cookies as only a Christmas cookie, but with OXO seasonal disc sets (spring, autumn, Christmas), there is a cookie shape for any occasion all year. If those designs aren’t enough, or if like me you get hooked on cookie press cookies, you need to know about Impress Bakeware, an online company that produces over 200 different shape discs in a variety of sizes to fit many different cookie presses. Scanning the Impress Bakeware site, I couldn’t resist adding to my cookie press disc collection with an angel and a USA disc for my military care packages. 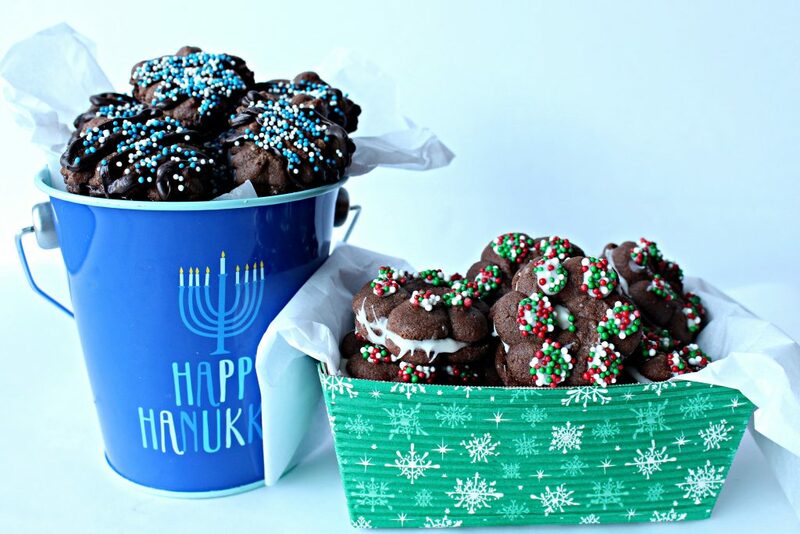 Once I chose the discs to make Chanukah dreidels and Christmas wreaths, I needed a recipe for spritz cookies that would be sturdy enough for mailing and gifting. Fragile cookies will crumble in transit. Chocolate Espresso Spritz Cookies are lightly crunchy, with a melt-in-your-mouth quality, but are not crumbly. To reinforce the sturdiness of Chocolate Espresso Spritz Cookies for shipping, I sandwiched them together with a melted chocolate filling. I used melting chocolate from Chocoley.com (Bada Bing Bada Boom dipping and coating formula). 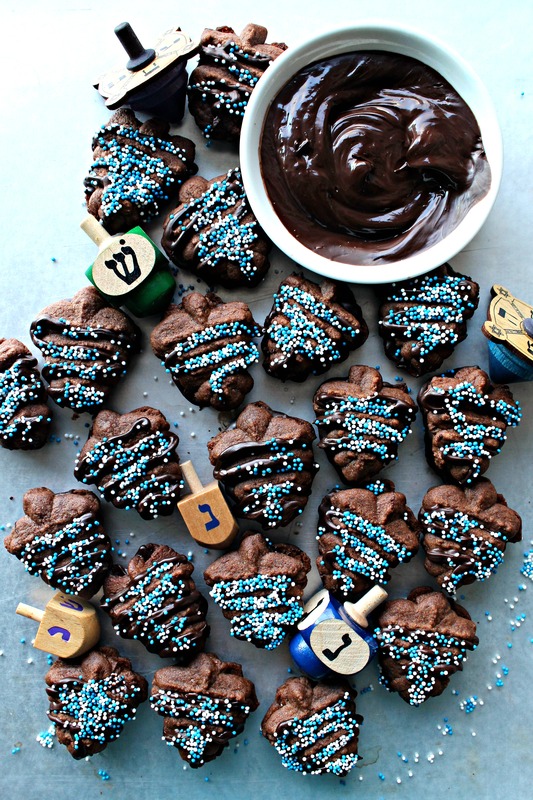 The dreidels are filled and decorated with dark melting chocolate and the wreaths are filled and decorated with white melting chocolate. I had so much fun making these Chocolate Espresso Spritz Cookies that I sent a text to my daughter saying that we should make these cookies as Christmas gifts for her co-teachers. My daughter had told me she was looking for a recipe for homemade treats for her co-teachers, but I didn’t realize she was talking about 19 co-teachers! 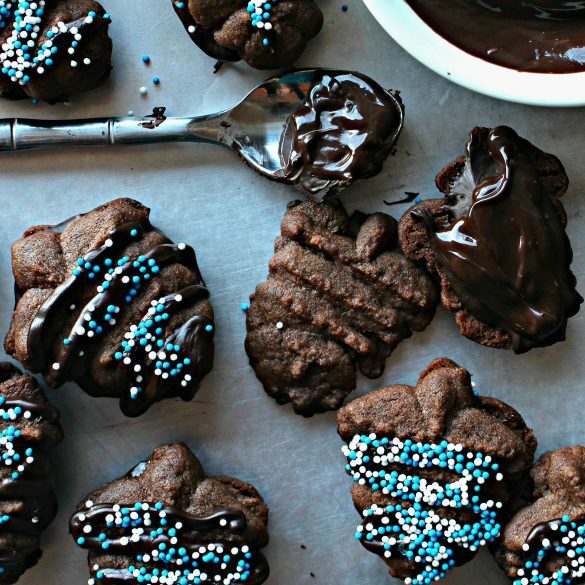 That’s ok. Chocolate Espresso Spritz Cookies fit our need for a recipe that makes a lot of beautiful and delicious cookies quickly. My cookie press is going to get a real workout this weekend! Chocolate Espresso Spritz Cookies are ideal for gifts, party platters, cookie exchanges, care packages, and Santa’s plate. Pick a shape and sprinkle that suites your celebration and enjoy! In a medium bowl, whisk together the flour, cocoa, and espresso powder. Set aside. Add the egg and vanilla. Mix to combine. Gradually add the flour mixture. Mixing just until incorporated. Fill a cookie press, fitted with the desired design disc, with the dough. Press out the cookies 1 inch apart, onto an unlined cookie sheet. Bake for about 7 minutes or until set. Remove from the oven and allow to cool on the baking sheet for 5 minutes before transferring to a wire rack to cool completely. Sandwich pairs of cookies, bottoms together, with melted chocolate spread or piped between the cookies. Place left over melted chocolate into a small ziplock bag with a small bit of a bottom corner cut off. Drizzle or dot the top of one cookie with melted chocolate. Immediately add sprinkles. Stored in an airtight container at room temperature, Chocolate Espresso Spritz Cookies stay fresh for at least 2 weeks. For shipping, sandwiching the spritz cookies adds sturdiness as well as deliciousness to the cookies. Store with wax paper between layers in a plastic storage container. Use crinkled wax paper at the top to ensure no movement within the container during shipping. Cookies decorated with chocolate should only be mailed to and from cool weather locations. For warm weather shipping, spritz cookies can be decorated by sprinkling with nonpareils before baking. Wendy these are wonderful! 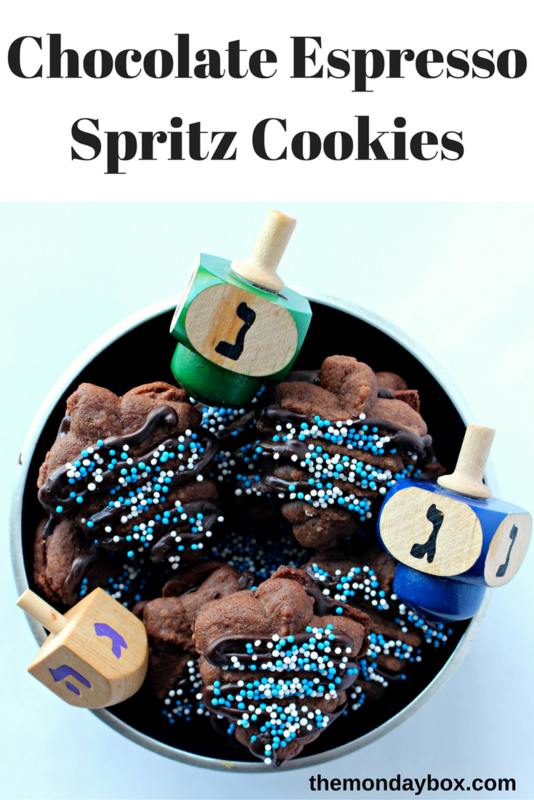 I love spritz cookies and cannot wait to try this chocolate version. Thank you so much for sharing it! Thanks, Tricia! I found the chocolate espresso flavor to be addicting. It is SO perfect with a cup of coffee. I never knew you could get all those different discs available for cookie presses. My mind is reeling with the possibilities. Your cookies are lovely. My Mother made these every Christmas, though she is long departed, I think I shall teach my grands the art of baking, to carry on the tradition. Love the grown up twist of expresso for pot lucks and hotess gifts. What a wonderful tradition to pass down to your grands, Diane! Kids will especially love the “magic” of a cookie press. 🙂 I hope you have a wonderful Christmas! Chocolate Espresso, oh my one of my favorite flavors! Hope you are having a good week and thanks so much for sharing with us at Full Plate Thursday! Is there a way to mke these cookies without a cookie press? I gave mine away many years ago and am at a point in my life where I don’t want to add more stuff! I love chocolate and coffee together and would like to try these. Thanks! Hi Marlene! You could definitely use this recipe with a small scoop or tablespoon like a drop cookie. Then just sandwich the resulting circle cookies together or eat individually without filling. I HIGHLY recommend that you look at this Chocolate Espresso Biscotti recipe too. It is one of my most popular recipes and is ideal for a chocolate-coffee lover! I hope you enjoy both recipes!